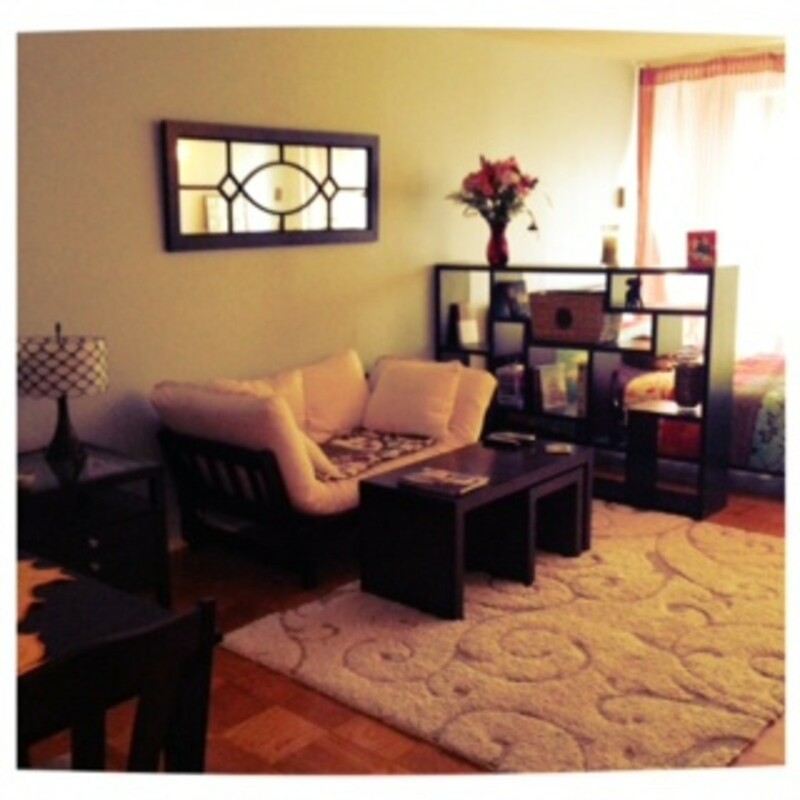 Giving a room the "shabby chic look" is quick and painless. In fact, you probably have pieces that you can already use. This quick guide will give you an idea on how to decide what pieces you will incorporate into your decor. 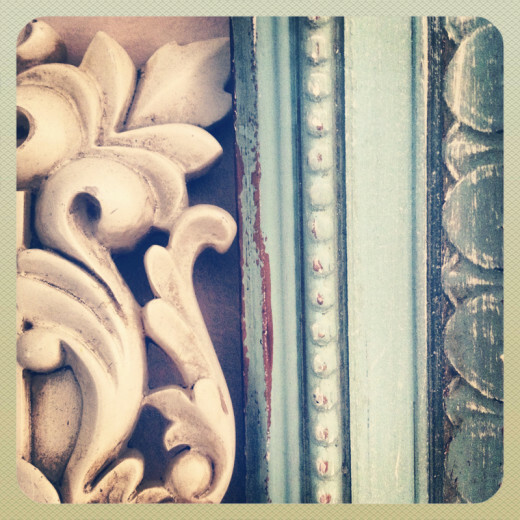 Using pieces of distressed furniture in shabby chic décor is a great place to start. You can use a naturally-aged wooden chair or dresser or speed up the antiquing process and make your own. 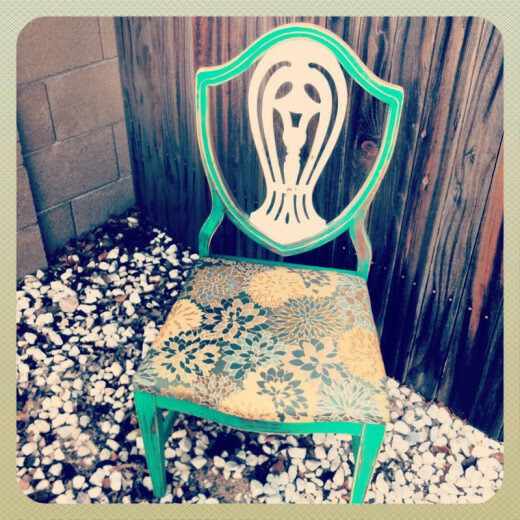 Antique stores and flea markets are great resources for finding the perfect furniture. Many times they have already been refinished or antiqued. 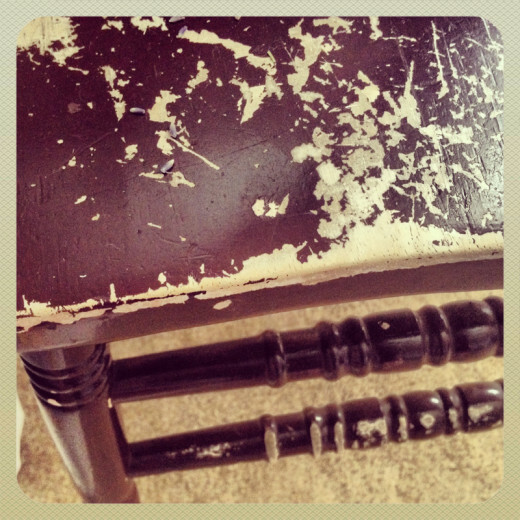 If you've never done this before, check out my tutorial on furniture antiquing and refinishing. While worn out furniture is a must-have, make sure your pillows and linens are not. There is nothing shabby chic about stained sheets with holes. I bought this mirror from Goodwill. I painted it with Clear Blue Sky by Glidden and some blue crackle paint from Michaels. Next I sanded all the corners and edges with coarse sandpaper. 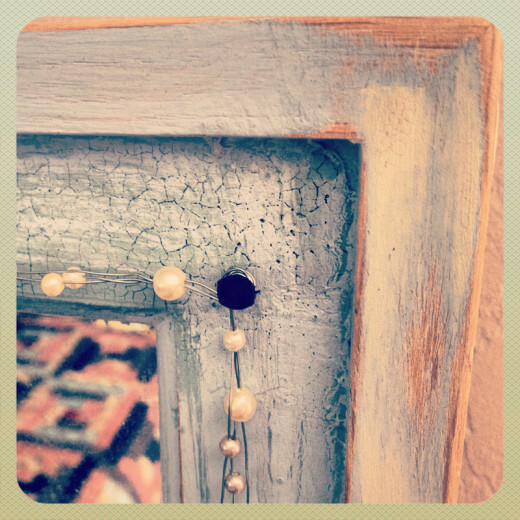 I strung faux crafting pearls on wire and twisted around the frame. Shabby chic really comes to life with the help of delicate flowers and floral designs. 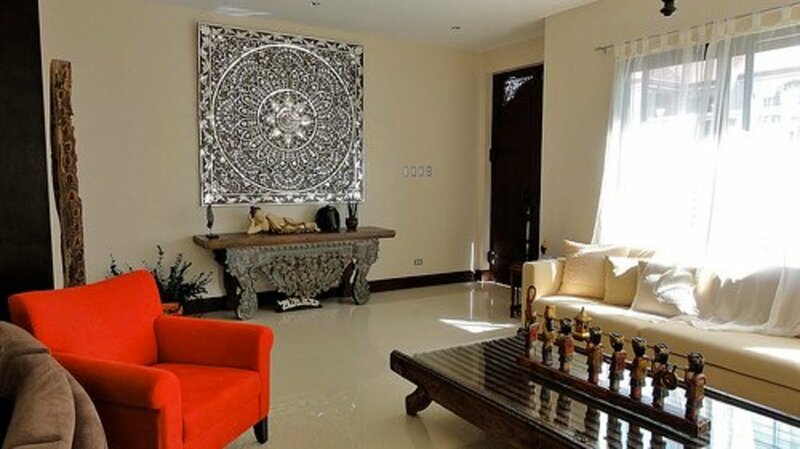 Without flowers, the shabby chic look can look dull-- even lifeless. Don't worry about what flowers do or don't compliment other colors or patterns. 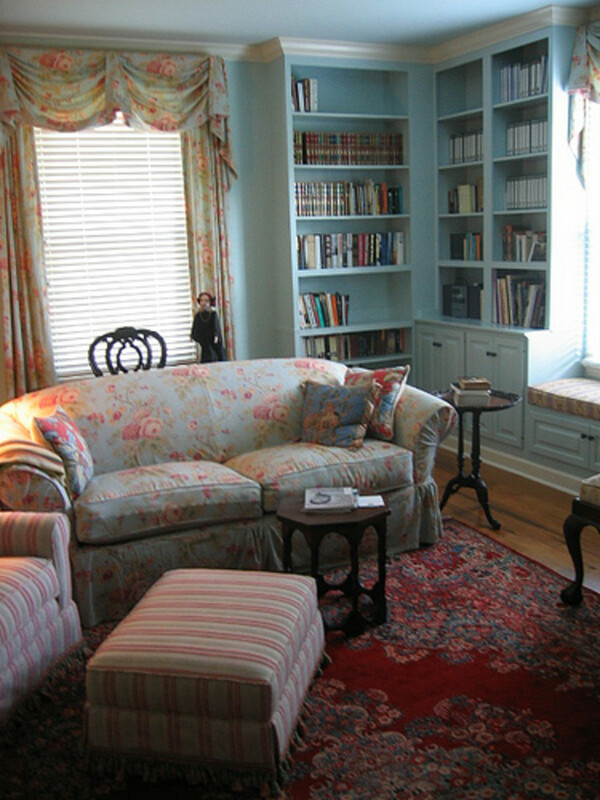 Shabby chic doesn't have to match-- in fact, the best executed shabby chic décor usually doesn't match. Mix and match it up even if it doesn't feel natural at first. When you're finished, you'll really see everything blend together in a beautiful look. 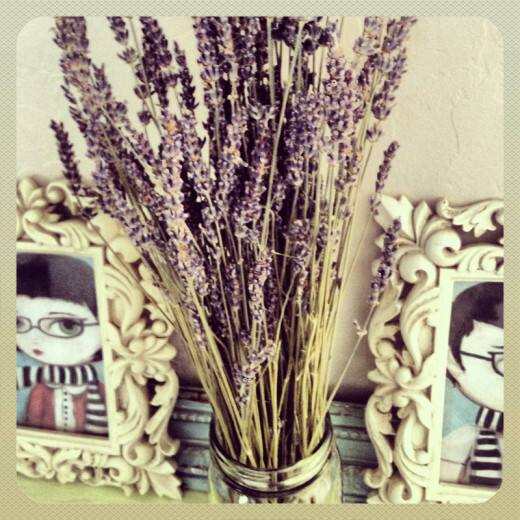 Dried lavender is naturally beautiful. I have this small bunch left over from How to Make a Lavender Wreath. 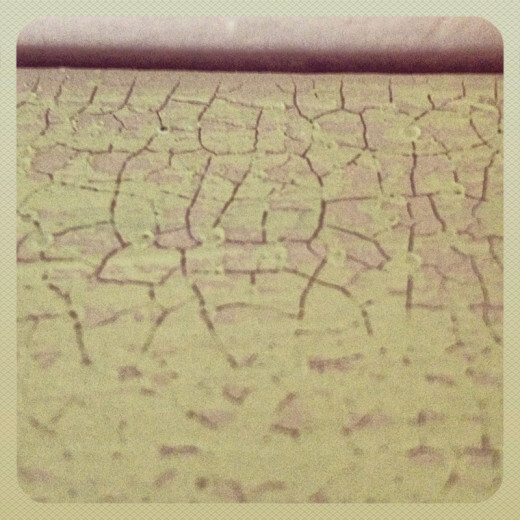 I painted this shelf in "oat" crackle paint by Martha Stewart and "celery sticks" by Glidden. If you love bright and bold colors, shabby chic might not be a look for you. 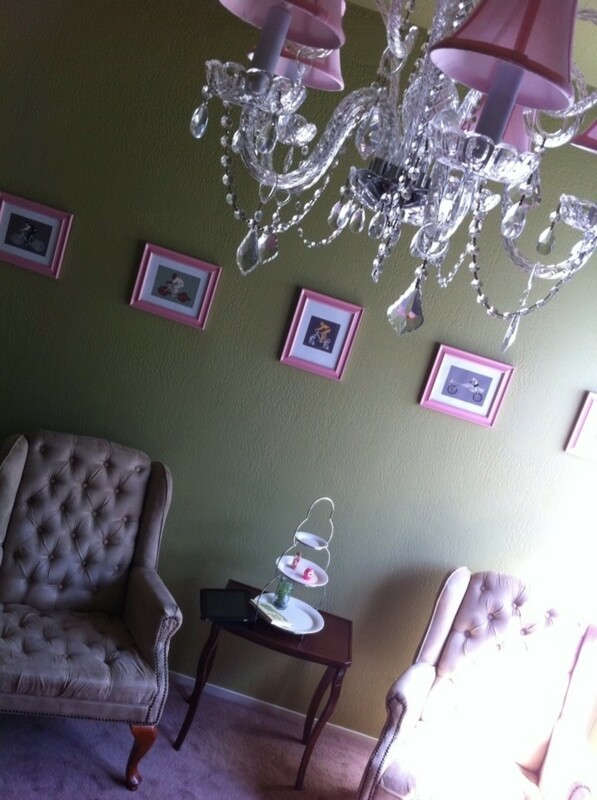 Shabby chic décor and style thrives on very delicate and feminine pastel colors. Think of an Easter palet left in the sun to fade. One of the reasons that shabby chic works so well and is practically effortless is because pastel colors very naturally compliment each other. 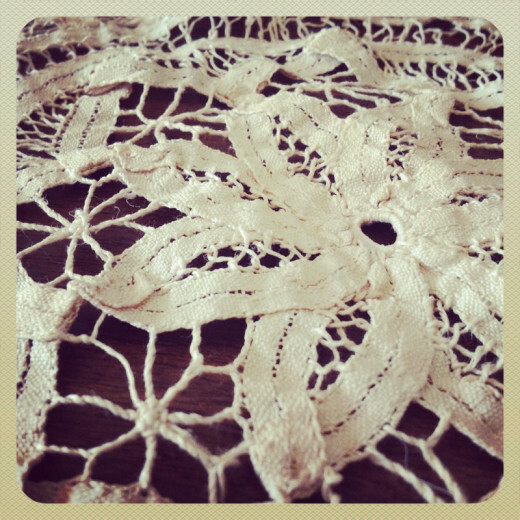 Most shabby chic collections will have a reoccuring theme (or motif) of white. White helps this decorating style to appear clean and fresh. You can really have as little or as much white as you'd like-- there's no rule. 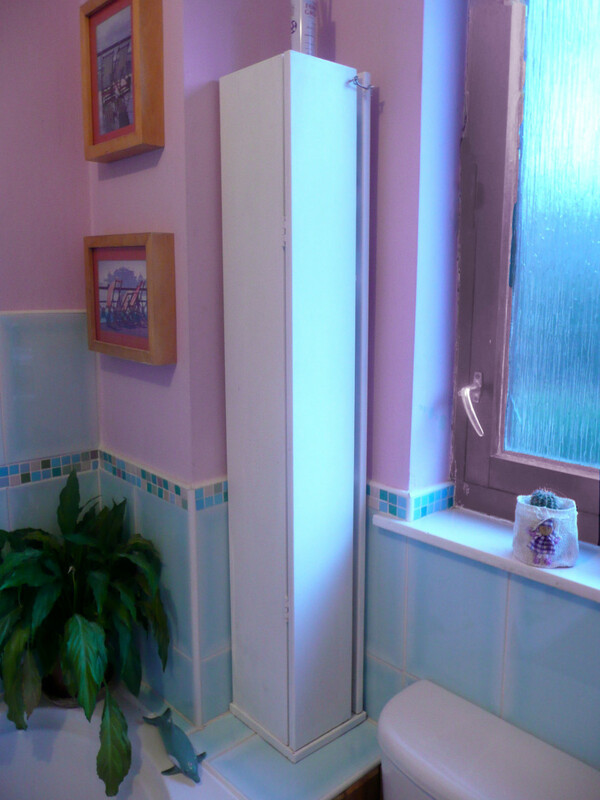 Investing time and money into a shabby chic décor has many benefits. Not only does it looks fantastic, but you don't have to clean out your bank account just to decorate a room. Pieces are affordable and easy to make on your own. Shabby chic style is also timeless and classic, not a fair-weathered trend-- meaning you won't see it going out of style anytime soon. Make an old piece look new or help a new piece look aged. Easy to follow guide with tips on how to transform any piece of furniture into a work of art. Includes pictures for inspiration. 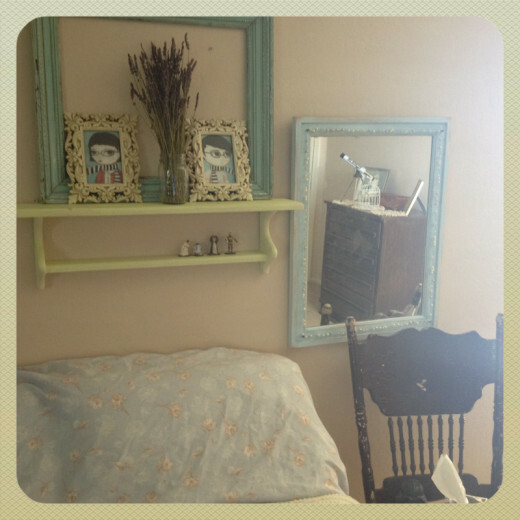 I love the faded, worn look of shabby chic - it's so cozy! 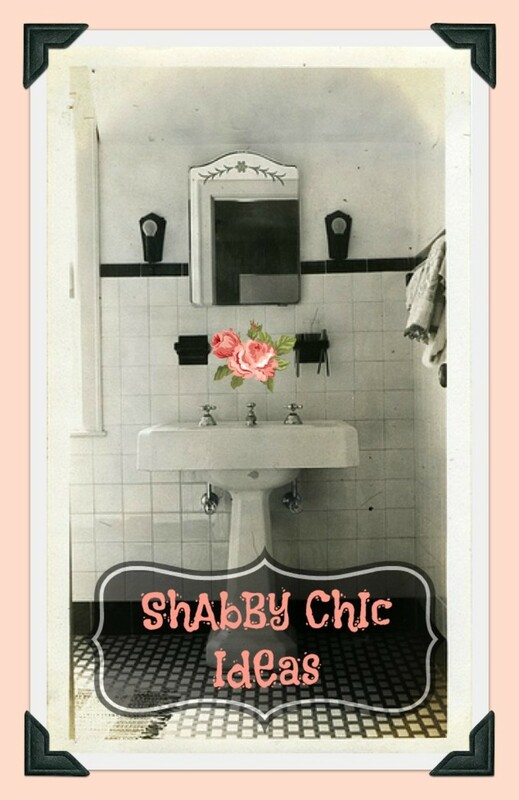 Real shabby chic takes some creativity and work. You can't buy shabby in a store! Great tips! 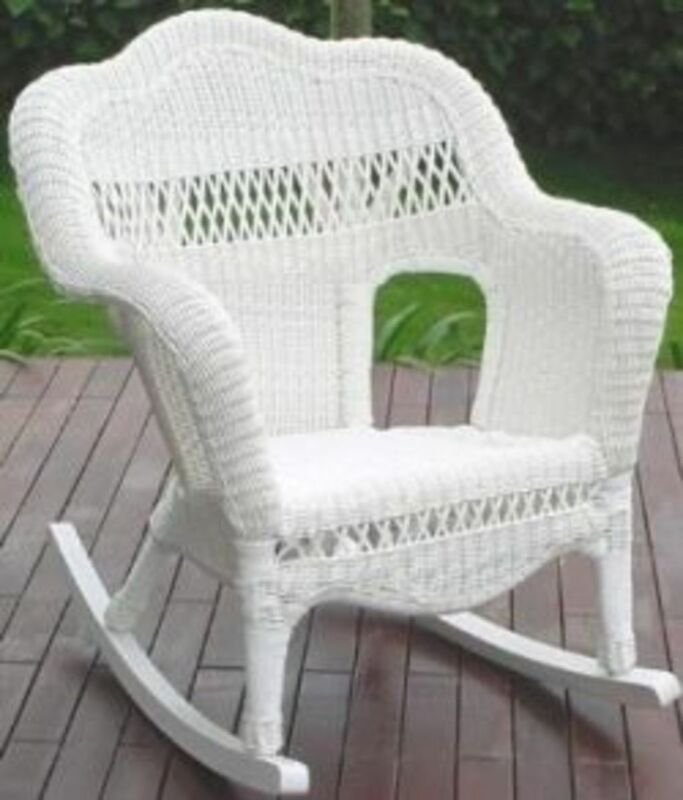 Re-decorating furniture with shabby chic looks great! I 'd like to try for myself - thanks voted up. I now look forward to so many more to come. Cosmic Bus-- thanks for reading and commenting. Target always has beautiful items! I love checking out their dollar sections and you're right, their bedding is gorgeous. I feel like I need a second and third job just to keep up with my Target shopping addiction. Kindred spirits indeed! Love this look particularly after looking at many boring home decors. You did a great job on this hub. Lots of interesting thoughts. VOte Up and share.